Simple and Easy to Use Platform for Life Coaching Services! Securing online appointments and managing personal client data has never been easier than with the Pulse 24/7 app. Get ahead of the competition by staying more organized. 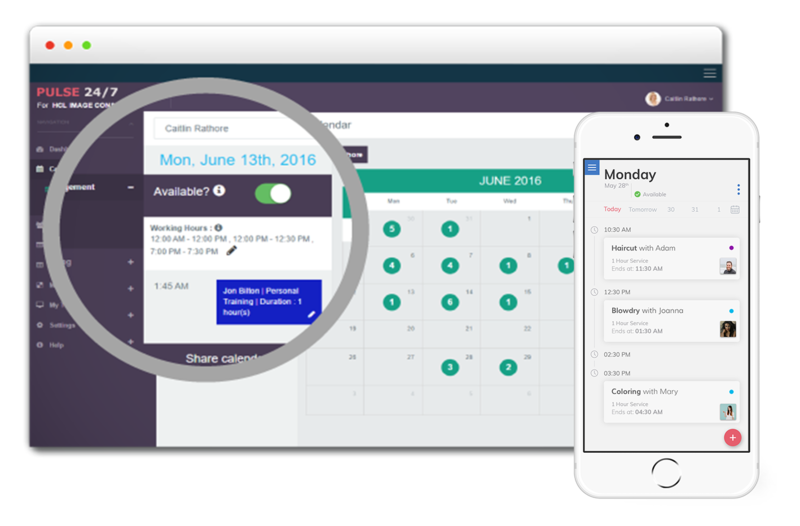 Set up your entire team’s schedule easily with Calendar Management. Get organized so you can better impact the lives of your clients. With fast online appointment scheduling and payments, your business will now operate smoother and hassle free so you can better support your clients. The group calendar view helps you manage and follow the schedules of the other hired healers. Why not try it for free with the only appointment booking app you need to run your business? The Service industry is changing. New technology is disrupting many professions. We launched Pulse 24/7 to empower freelancers and small businesses all across the globe to simplify and enhance their business through integration and automation. Empowering service providers is a passion we feel strongly about. From Innovation to Education to Empowerment, our platform has fundamentally changed the way service providers function and compete in today's new mobile economy in just a few clicks. © Copyright Pulse 24/7 Inc. All rights Reserved.